We’re probably all tired of arguments about whether the individual mandate is constitutional, right? I mean, the arguments have been made and someone on the Supreme Court is already busily at work writing a majority opinion telling us whether it is or isn’t. But Andrew Sprung hasn’t given up talking about it, and today he riffs off a song that contains the line, “But the car that you are driving doesn’t really belong to you.” And that reminds me of something. them. When I bought my last car, for example, I was forced by federal law to also buy seat belts and air bags — and as far as I know, no court has ever suggested the federal government lacks this power. Why? Technically, of course, the government isn’t forcing me to buy these things. I could, if I wanted, forego the purchase of a car. This isn’t very practical where I live, serviced as I am by a single bus line that comes by once an hour, but I could do it. I could also move someplace with better transit. I’m not absolutely mandated to own seat belts and airbags. But in real life, the fact is that most of us need a car. It’s only an option in the most hyperlegalistic sense, which means that for all practical purposes the federal government has mandated that I buy seat belts and airbags. And they’ve done that on the theory that even if I don’t care about my own safety, other people might ride in my car and they deserve protection. What’s more, taxpayers could end up on the hook for medical care if I injure myself and my passengers. So seat belts and airbags are the law. Practically speaking, then, what’s the difference between this and an insurance mandate? In both cases the federal government is forcing me to buy something I might not want. The cost of complying with both mandates is substantial. You can be fined for disabling airbags or removing seat belts, just as Obamacare fines you for not buying health insurance. They’re pretty damn similar. 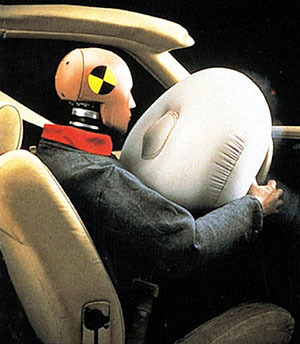 I understand that it’s possible to draw a distinction between airbag mandates and health insurance mandates. It’s possible to draw a distinction between anything if you put your mind to it. But in real-life terms, what’s really the difference? Not much, it seems to me. Unless you live the life of a hermit, Congress already regulates inactivity heavily and extensively. There’s stuff you have to buy whether you like it or not. Welcome to the modern world.